Francisco Goya, a great Spanish painter, is known for his dark, terrifying and gloomy presentation of his subjects. However, his influence over other topics such as politics, governance and history was nothing less. He supported the Spanish troops and civilians during the rebellion against the French; The Second of May 1808 and The Third of May 1808 are a result of this support. These paintings are considered to be among the masterpieces Goya has produced. Rightly so, for their intense portrayal and realistic depiction of the scenes those were witnessed during a rebellion. Napoleon Bonaparte sought the alliance of Charles IV, the king of Spain. This was thought to be an act to take over Portugal with the help of Spanish army. Charles IV allowed the French army to pass through the country, which was the worst mistake he could possibly do. Napoleon, whose real intention was to occupy Spain, ordered to conquer the country with the French troops that were already in the Spanish lands. Charles IV abdicated due to pressure and the French tried to take out members of the Royal Family of Spain. This act was not pleasing for the people who rebelled against the French on the second of May 1808. Civilians who were not properly armed came to the streets of Madrid and protested against the presence of French in their country. The protest turned to a fight as the French general moved troops against the protestors. A huge battle is fought near Peurta de Toledo and Puerta del Sol. Unfortunately, the French army proved too much for the protestors who were killed in large numbers. The presence of Francisco Goya during this rebellion is not known with clarity but he was the one to request the subject as commemoration for the people who gave their lives for the country. Thus The Second of May 1808 and The Third of May 1808 were created by Goya in a matter of months. The painting was commissioned by the Spanish Government after the French army is completely removed from the country in the year 1814. Francisco Goya complete both the paintings within months but the depiction of people with normal tools as weapons displeased everyone. As a result, they were not given importance for many years. After many years, analysts recognized the contemporary greatness of the works and they gained popularity. Francisco Goya is believed to be influenced heavily by Peter Paul Rubens and The Second of May 1808 is said to be amongst the paintings that is drawn under the model of Rubens’ painting. The work of Goya resembles in use of objects, people and background with the painting titled “Henry IV at the Battle of Ivry” by Rubens. Despite this remark the painting has gained its own uniqueness and historical importance. The people of Madrid are shown with regular knives and sticks while the French have swords made to kill the enemy. Further, they are mount on horses that are bulky and seems to have experience of war as they are not scared of the people surrounding them. The people on the other hand are shown with different emotions in the painting. Anger, fear, surprise, anxiety, sadness and many other emotions are shown on the faces of the protestors. Two of the protestors are shown with prominence. One is stabbing a soldier with a furious face while the other is poking a horse with his knife. The soldiers have cruel faces and are holding their weapons with an intention to severely hurt the civilians. It is interesting to note that only two protestors are killed, which equals the number of dead French soldiers. Goya shows his patriotism through an alteration of facts and secretly states that the Spanish are second to none. 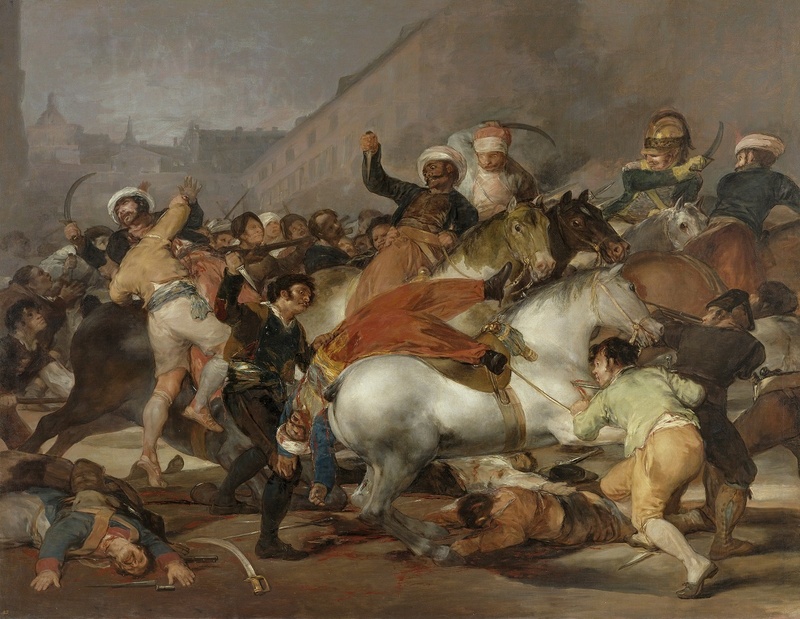 Although the realistic depiction of the rebellion did not acquire fame, The Second of May 1808 has become one of the most studied paintings of Goya because of the historical importance the painting has. Its twin painting has even more importance and together they show the patriotism, love and passion of the Spanish people towards their country.